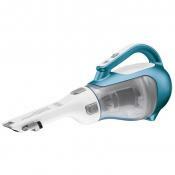 This model can be easily transformed into a handheld vac to comfortably clean the car interior, upholstery, and stairs. 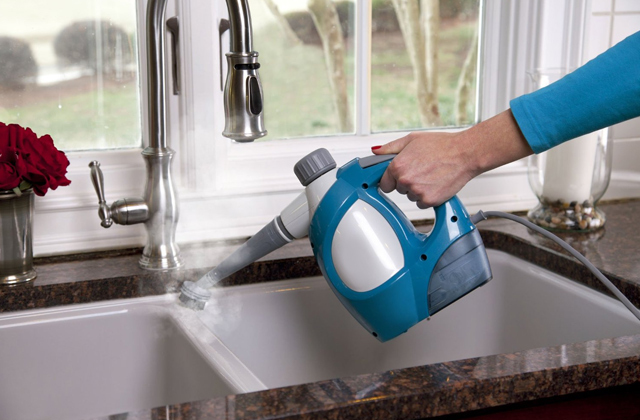 4 different nozzles included in the kit will let you achieve flawless cleaning results even in hard-to-reach areas. A dust cup fills up rather quickly. 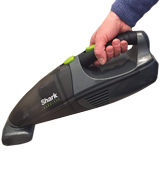 The Shark IR101 is an ideal tool for high-quality cleaning of all types of surfaces, from hardwood floors to soft rugs to thick carpets. The smart response technology allows you to select the optimal power level for different tasks while a compact design with an ergonomic handle will not cause excessive fatigue during operation. The WindTunnel technology ensures excellent vacuuming results at a single pass while a powerful suction will equally efficiently remove both light surface debris and strong contamination. The dustbin release button is not responsive enough. The cordless vacuum from Hoover provides every freedom of movements and mobility during cleanups to maneuver in between and around obstacles. Its Edge Cleaning Bristles penetrate deeply into the pile where ordinary cleaners fail. The model is suitable for dry cleaning of all flooring types while a detachable washable filter extends the unit life and enhances its efficiency. 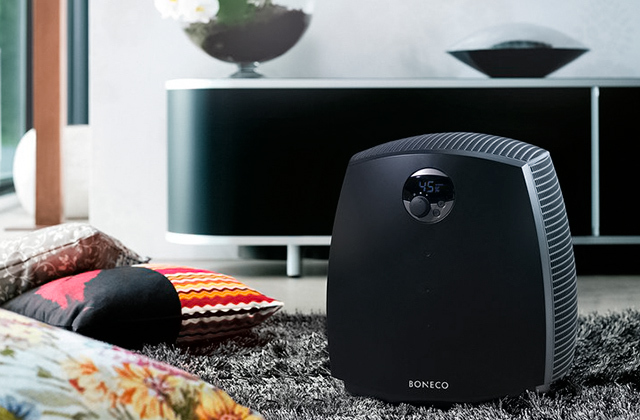 A 3-step filtration system provides the highest level of air cleaning without dust clogs while a high-capacity battery enables a long-lasting and powerful performance of the cleaner. The air filter valve needs regular declogging. 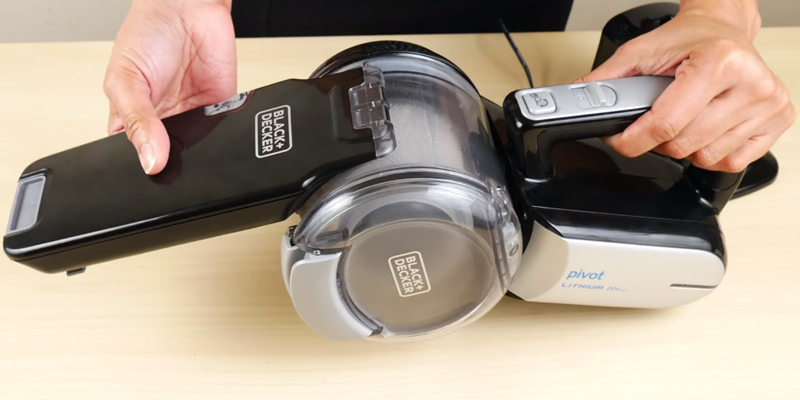 If you look for a functional and effective yet simple-to-use handheld vacuum cleaner, there's hardly a better choice than the Black and Decker BDH2000PL. Cleverly combining high-performance, portability, and a well-balanced design, it's one of the best mini vacs for minor daily cleanups. Though compact, this cordless handheld vac offers an impressive running time of 25 minutes (subject to a full battery charge) which is enough for a thorough cleanup in a car or dedusting surfaces in several rooms. The crevice tool is somewhat inconvenient. This is one of the lightest cordless vacuums out there. It is easy to handle and allows for prolonged operation without hand strain and fatigue. 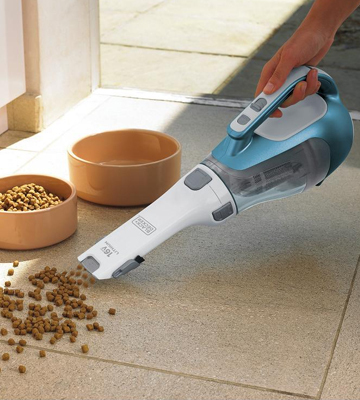 Thanks to the Twister suction technology, the Shark LV801 perfectly tackles pet hair and dander that makes it a great choice for pet owners. 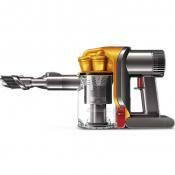 Black&Decker offers here an undeniably multi-functional device. 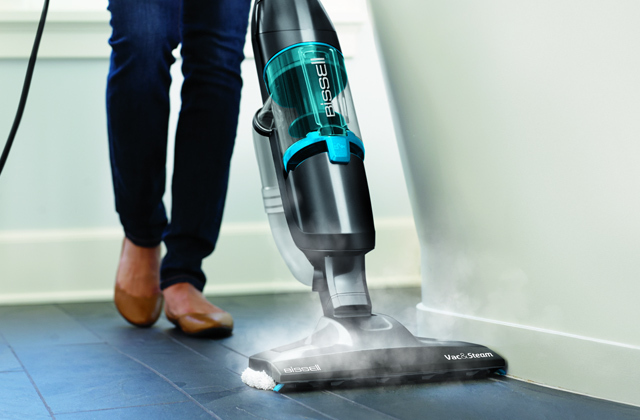 An on-board extension makes using this cordless vacuum very quick and convenient. The suction might seem a bit insufficient for some tasks. Having purchased this model, you will definitely receive a great cordless vacuum cleaner with a large dust cup and a convenient docking station. This is a great choice for a fast cleaning of your room or car interior. 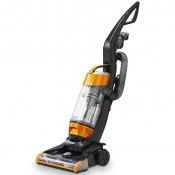 Shark is a renowned and one of the leading brands in the world of home cleaning appliances. 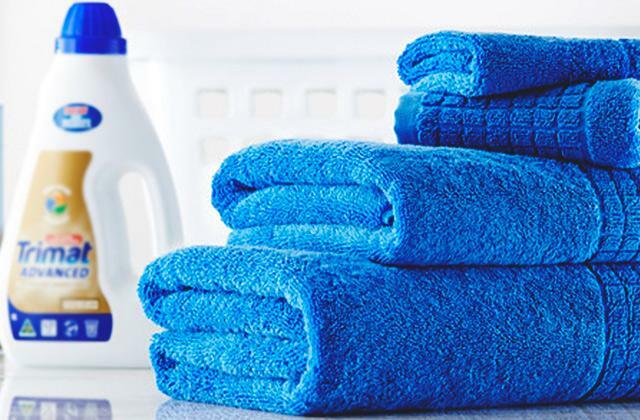 The company is focused around simple yet highly functional technological solutions that allow customers to achieve maximum efficient cleaning results with the utmost convenience and minimum efforts. 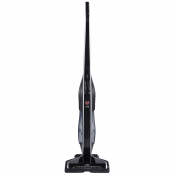 The manufacturer offers a whole range of vacuum cleaners including the ION Rocket stick vac combining powerful performance and cordless design. The biggest problem about a cordless vac is limited runtime. Yet, it’s not an issue with this model. Featuring an ION power battery pack, the vacuum cleaner can be continuously operated for 30 minutes without suction power decrease that is enough for routine domestic cleanups. With regards to the unit design, it is created to perform multiple cleaning tasks and boasts floor to ceiling versatility providing threefold functionality. It means you can use it as an upright stick vac to clean hard floors and soft carpets, as a handheld vac with an extension wand to clean at heights (ceiling panels, windows, door moldings, chandeliers, etc. ), and as a mini hand vac to clean upholstery, car interior, and for some minor cleaning jobs around the house. All of this is possible thanks to a convertible cleaner construction and the number of attachments included in the set. 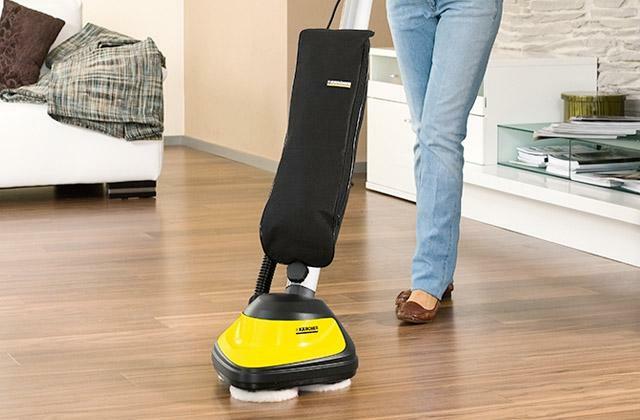 A motorized head easily glides over the floor ensuring a seamless transition from hard flooring to soft carpets while a brush roll quickly rotates to press stiff bristles deep into the soft pile to cope with the ground in dirt and dust. A cordless unit design in no way compromises the suction power and the Shark Rocket efficiently handles all types of dry wastes. 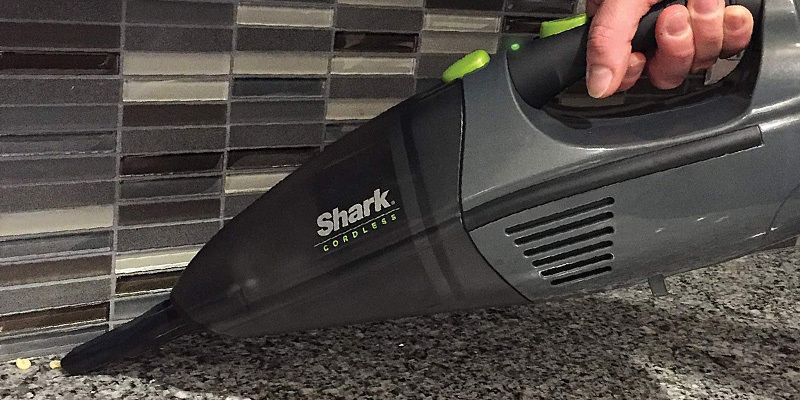 Distinguished by a fully-fledged package and easy-to-transform construction, the ION Rocket stick vac from Shark is a perfect solution for regular all-around cleanups. 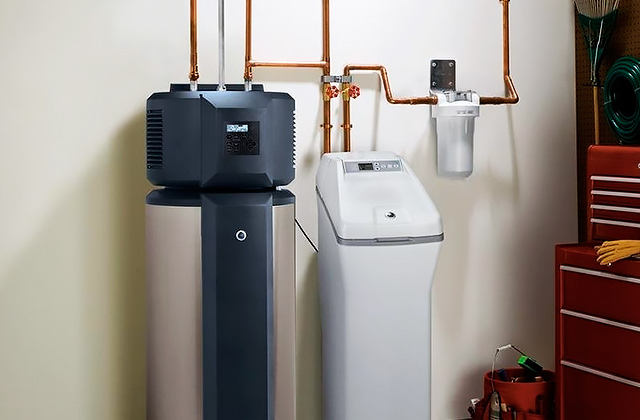 The Shark Ion Rocket comes complete with several smart features allowing you to optimize the vacuum operation and get the most out of its performance. First of all, the battery pack is removable and can be charged anywhere. And you can get a spare battery to continue cleaning while the first battery is being charged. This will let you upgrade your cleaner runtime and increase it twice. On top of that, the smart response technology will let you select the optimal power level for different cleaning tasks at hand and further maximize the operation time. Besides, once you lock your vac in an upright position, the brush roll will automatically stop in several seconds to save the battery charge. 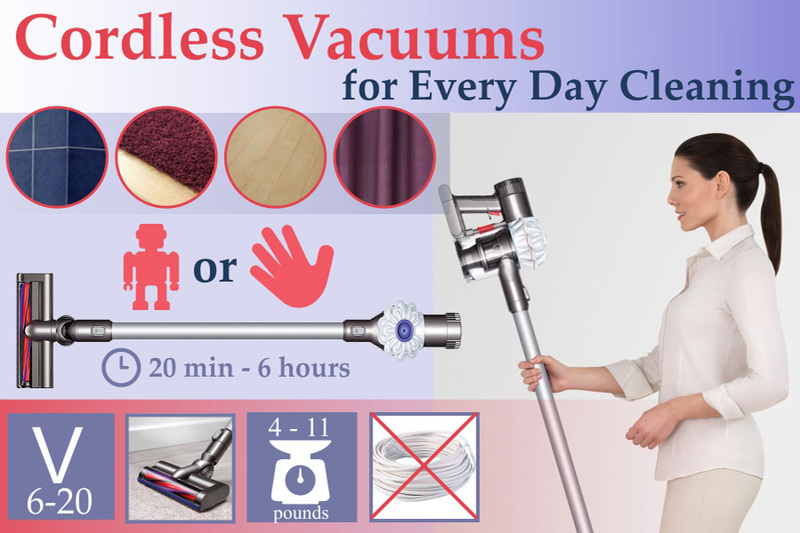 Thanks to rapid technological progress, the modern market offers a whole variety of vacuums for all possible cleaning tasks. Numerous tedious jobs that had to be done manually are now automatized saving your time and effort on daily cleaning routines. Yet, it’s common knowledge that originally, vacuum cleaners were created to de-dust all types of floor surfaces, replacing inefficient brooms and different kinds of brushes. And this is where the Hoover Linx stick vacuum really excels. The unit comes in an upright stick design. And though it is not convertible to a handheld vac and has no extension wands or added attachment accessories, it perfectly does the floor cleaning job it is designed for and makes an ideal alternative to bulkier and clumsier conventional vacs or heavy-duty uprights. 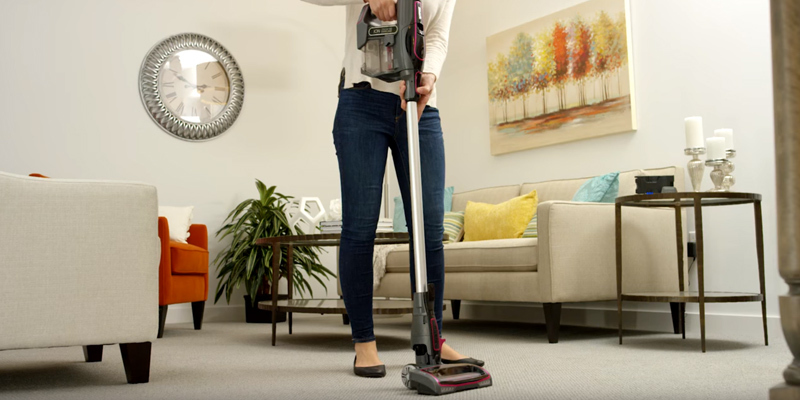 The Hoover Linx offers cordless convenience and ergonomic sleek construction thought out to the last detail, making floor cleaning maximum convenient and fatigue-free. A slightly tilted handle with fingertips controls will let you easily push and navigate the unit through the house. 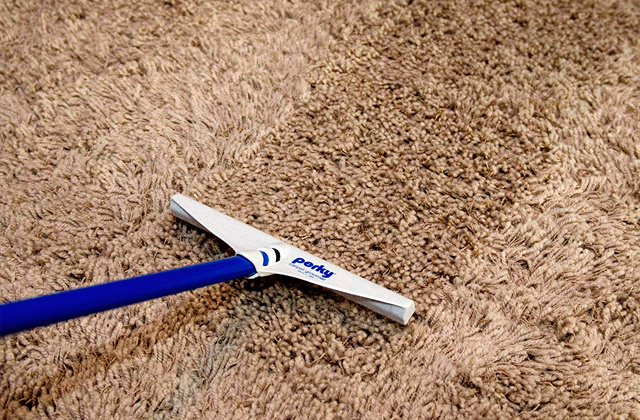 An electronic cleaning brush provides multi-floor versatility flawlessly transitioning from hard floors to soft carpets and leaving no dust lines or uncaptured debris on the boundary. The WindTunnel® technology delivers ideal cleaning results at a single pass, creating powerful channeled suction to equally efficiently remove both light surface debris and embedded dry dirt. Besides, the Edge Cleaning Bristles pick up dust flocks, hairs, and dirt on those tricky edges where many other dust busters will fail. In addition, a pretty capacious 0.5L dust container will save you the trouble to interrupt the cleaning to discard wastes. 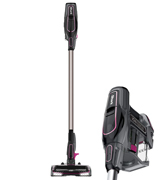 Though the Hoover Linx is not packed with numerous bells and whistles that you might find in other similar models, yet, it is fitted with all essential features and technologies, making cleaning of large floor areas maximum efficient and easy. If you live in a large house and have a family with two or more little kids and several pets, you know firsthand how much mess you might have to manage every day. Crumbs, popcorn, and other food remnants under the tables, in between the couches and armchairs, pet hair and litter stuck to rugs and carpets, dry mud traces on the tile floor at the entrance, to say nothing of dust and dirt accumulating in the corners and near the walls. All of this can become unbearable since you have to pick a broom and a scoop or take your conventional vac out of the closet several times a day. 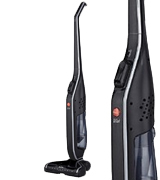 With the Hoover vac, you’ll get the powerful performance of a corded vac in a cordless design. 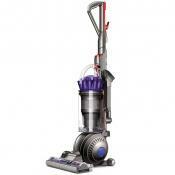 Powered by the 18V battery, the unit generates a forceful suction power to tackle all sorts of dry wastes. 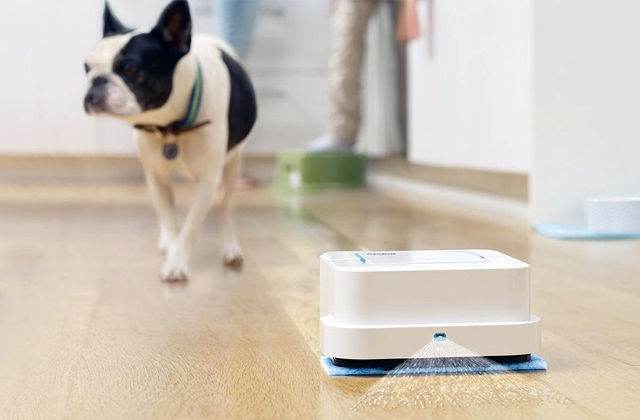 Meanwhile, it offers continuous runtime of about 20 minutes which is enough for a whole-room cleaning and occasionally removing minor messes. You won’t be limited by the power cord and will be able to easily maneuver the vac around the furniture and vacuum alongside and under the cabinets and furniture. Moreover, the unit is slim and compact, hence, you can conveniently store it within easy reach somewhere in the corner or near the wall. Oh yeah, it is small and light. When fully charged, it lasts for 17 minutes. The battery is separate which is great. Wheel bearings are MUCH better, and feel more solid; general construction feels better. It's very nice that the filter is washable. 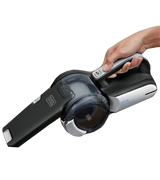 A portable vacuum cleaner from Black & Decker is one of the best-selling mini vacs available on the market today. 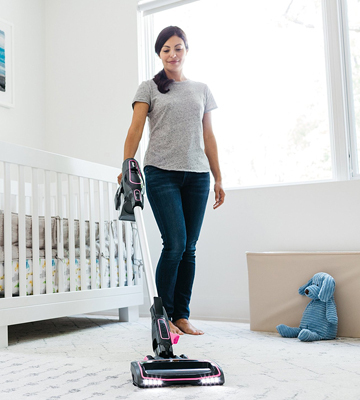 It boasts compact size and cordless design, so you can easily carry it around your house and take it anywhere you need to perform quick on-the-spot vacuuming. This handheld vac is designed to clean even the most hard-to-reach areas of your house such as cupboards, shelves, areas between furniture and walls, etc. 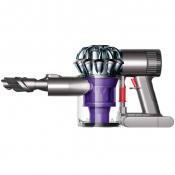 Thanks to a pivoting nozzle, the Black & Decker will get where other models fail. When the nozzle is folded down, the appliance is pretty compact and does not take much storage space. Despite its cordless design and pretty small dimensions, the Dyson BDH2000PL features a high-performance motor generating impressively strong suction power that allows you to pick all kinds of dust and debris, be it pet food, popcorn, crumbs or lint or hairs. 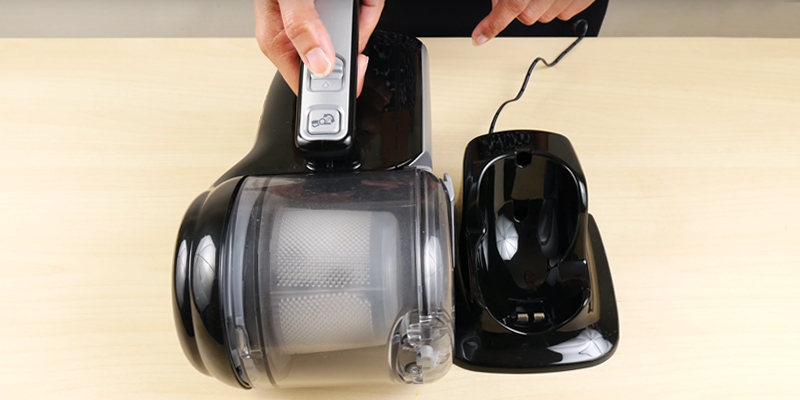 Just like other cordless Black & Decker models, this mini vacuum boasts the cutting-edge cyclonic action that spins the rubbish away from the filter right into the dust container. Some cordless handheld vacs suffer from a gradual decrease in power when the battery is running low, but it’s not the case with the BDH2000PL. Powered by a 20V Lithium battery, the unit stands out for its fade-free power and consistent operation. A 3-stage filtration system with a pleated filter ensures super-fine exhaust air cleaning quality and efficiently prevents clogs. The dust container is clear and it's easy to see when it gets full to empty it in time. Besides, you can detach the dustbin and rinse it under the running water, which is very convenient. Compact yet powerful, this vacuum cleaner delivers cleaning performance close to that of a full-scale vac and will become your dependable domestic helper. 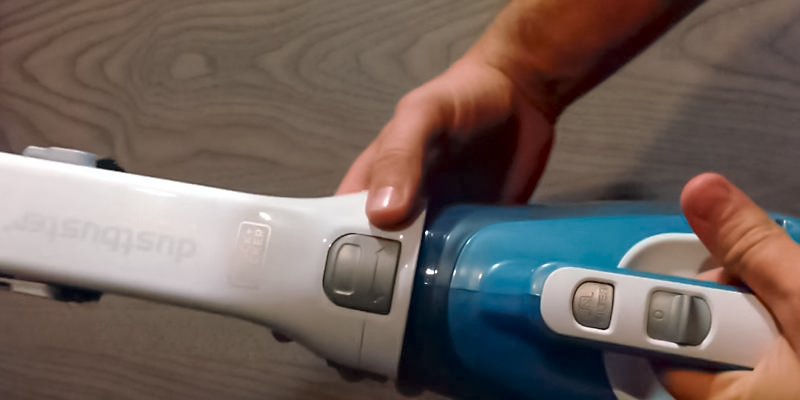 What really sets this handheld vacuum cleaner apart from other models is an exclusive pivoting nozzle designed to cope with odd jobs most traditional uprights can’t handle. What’s so special about this accessory? Actually, it looks like a common crevice tool. Yet, it pivots up to 200 degrees while maintaining suction to reach those awkward places. Moreover, it’s extendable to get into hard-to-access areas and features a wide mouth to scoop up large debris. Besides, there is a small flip-up brush to clean fine surfaces and upholstery. With that said, this small cordless handheld vac ensures efficient cleaning of stairs, floors, carpets, shelves, and so on. Though most other dust busters come with more attachments, this model is extremely functional without any add-ons. The unit folds up nicely and looks pretty smart on the counter with it's charging stand. Very convenient and spatially compact. The charge seems to last 15 minutes or so which is adequate for it's needs. Super quality product and totally happy with it. Rarely get a 5 star item like this. I decided to buy this product because of its ability to fold and being wireless is also a feature which I enjoyed not only on this model but my other black and decker as well. If you are a happy owner of at least one or even several four-legged companion, great chances are that you have to do vacuuming twice more often than those who don’t have pets. And it’s no wonder since pets constantly loose hair, scatter food, and can bring mud, soil, sand, and dirt from outdoors. To keep your house neat and clean, you simply have to do cleaning more often. Hence, a good handheld vac will become a real find for any pet owner that will save him/her the need to take a full-scale vac out of the closet to remove minor messes. 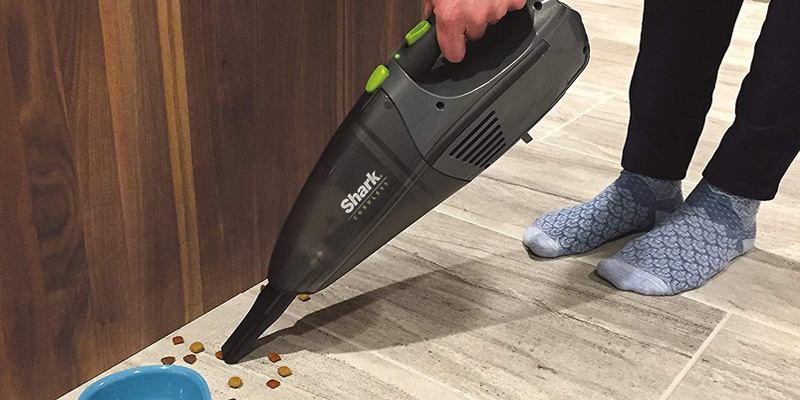 This is where a cordless hand vacuum from Shark will come in handy. 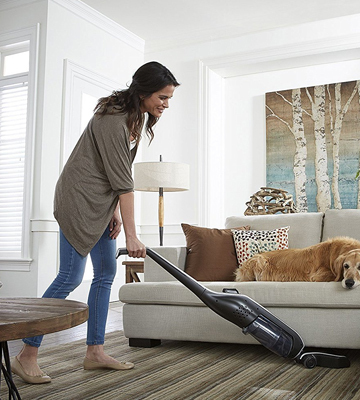 The unit comes equipped with a detachable motorized brush that features short stiff bristles easily and efficiently capturing pet hair and dirt deeply embedded in the carpet pile and upholstery. 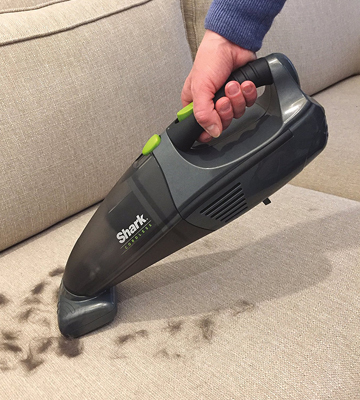 Hence, if your fluffy friend likes to lounge on the couch, your favorite armchair or even sleeps at your feet in the bed, the Shark will help you keep your upholstery, rugs, and carpets free from pet hair and dust. 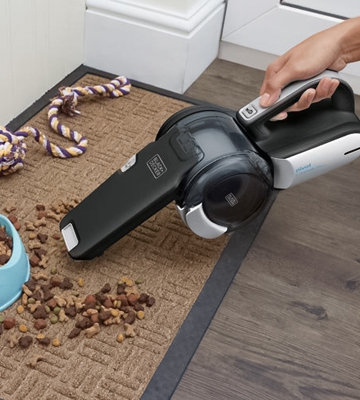 Besides, the vac package also includes a crevice tool that will let you quickly and efficiently pick up scattered pet food, litter, crumbs, and popcorn as well as tackle dust, debris, and wastes in hard-to-reach areas, such as tricky nooks, corners, and crevices around the walls. Besides, you are free to get literally anywhere since no power cord will limit your work. And the battery ensures a decent running time of 25 minutes which is more than enough for most minor cleanings tasks and thorough spot cleanups. With 0.6 L dustbin capacity, which is close to that of a full-scale upright cleaner, and a dust cup filter, no dust particle or debris will escape from this vac, making it ideal for all-around cleanups. 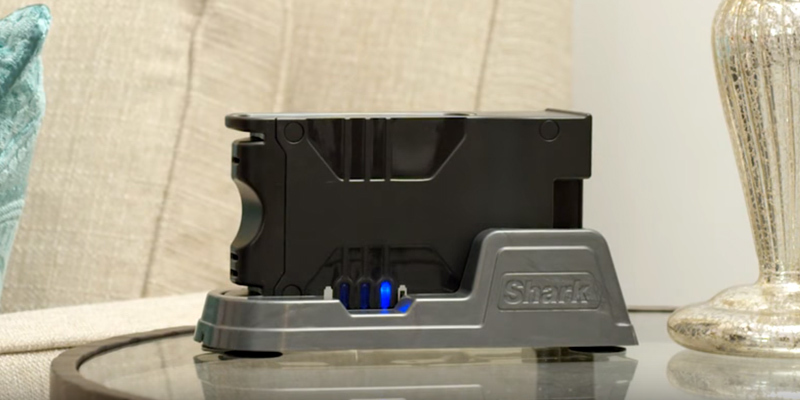 Being a great choice for pet owners, the Shark LV801 is also perfectly suitable for other customers who need a device for small-scale cleaning jobs around the house. 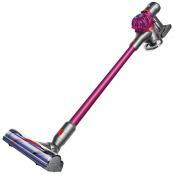 All handheld vacs are pretty lightweight since they are meant to be carried in hands. Yet, the Shark LV801 is exceptionally lightweight ensuring extremely easy handling. Weighing less than 2.5 lbs, it causes no added arm strains or fatigue. Meanwhile, the handle ensures a comfortable grip and oblong design creates perfect balance, further simplifying its handling. 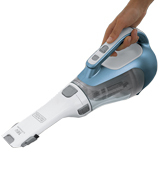 However, the lightweight design in no way compromises this little dustbuster sucking performance. The Twister suction technology ensures really strong and powerful suction enough to pick up small and larger debris and even tackle the ground-in dirt. A combo of lightweight, cordless design and powerful performance makes this model a great match for cleaning the interior of your car, boat, and even RV. 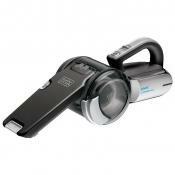 This model of Black & Decker handheld cordless vacuum cleaner helps quickly remove dirt from any room. 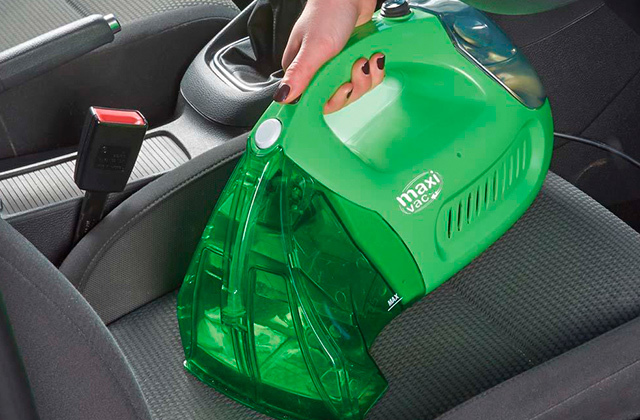 A 16 V battery offers 10 minutes of cleaning, leaving no dust behind. And this very battery has a truly unmatched feature. It can hold a charge for up to 18 months! That's really impressive! Coming to your countryside house for a summer vacation, you can get to work immediately without waiting for a device to get fully charged. Though, even if you unexpectedly run out of charge, it will take you no more than 4 hours to recharge the vac. Simple and convenient. That's what we can say about this cordless vacuum from Black & Decker. A brush is attached to the vacuum cleaner body, you only need to reattach it to the end, that's all! And if you have two heavy armchairs and need to clean the dust between them, that's also possible with a slide-out tube extension. You think that's all? Aha, here is another surprise. 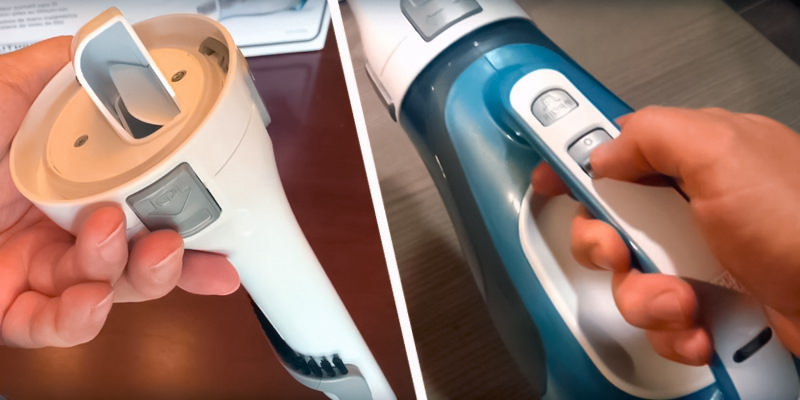 The nozzle of this cordless vacuum rotates 360°, and that can become an invaluable addition when cleaning hard-to-reach places. Moreover, you can easily remove the filter and the 0.6-liter dust container for cleaning. The charger comes in a form of a docking station that can also be used as a stand. Visually, it resembles an electric kettle stand and handles 4.8 lbs of cleaner's weight perfectly. To sum it up, we'd say this cordless vacuum cleaner is an unalloyed pleasure to operate and maintain. With the cleaner itself and its docking station, you will also find a washable pre-filter, a washable filter, an on-board crevice tool, and an on-board brush. The very first vacuum cleaner was created in 1869 in the USA, and in 1860 the patent was issued to Daniel Hess for a device called the "carpet sweeper". 8 years later, Ives W. McGaffney from Chicago designed the "Whirlwind" device, which he had been selling at $25 each next year. 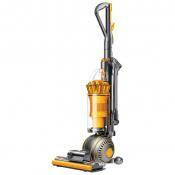 The first cyclonic vacuum cleaner was patented in 1928 by Cleveland's P.A. Geier Company, and the first patent for bagless cyclonic vacuums was given to Amway in 1959. In 2008 the oldest among working vacuum cleaners had died. It had been operating for 70 years. It recharges pretty quickly. The base is better to set it in and gets a better connection. It also has a better way of letting you know better when it is fully charged. Extending snout works well to get in-between seats in truck. Washable filter that actually is pretty good filter. What Is a Cordless Vacuum? 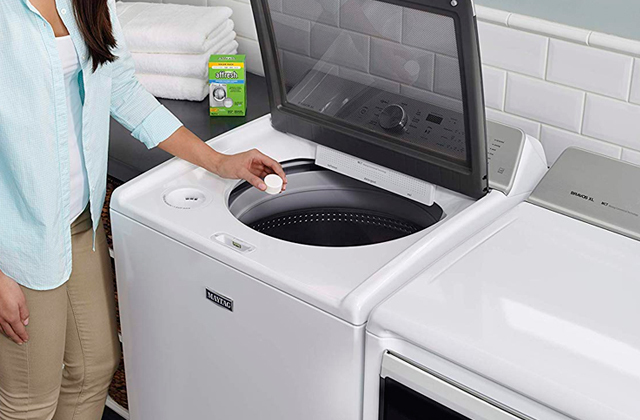 You might enjoy cleaning if there are right appliances to help you deal with it. 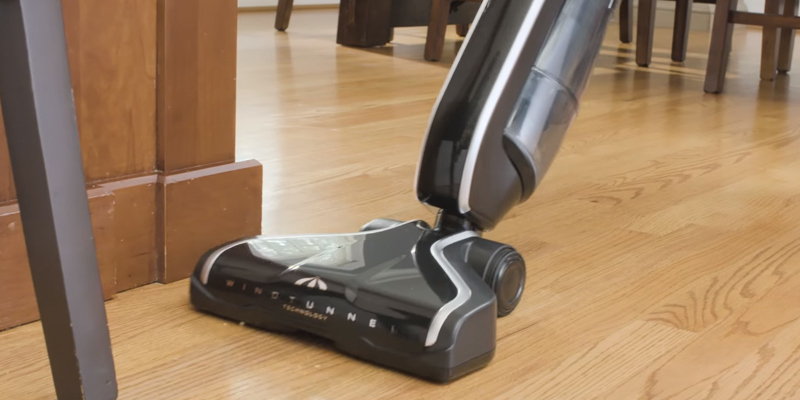 Meet cordless vacuums! The modern devices to provide quality cleaning using a power from the embedded battery. 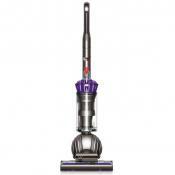 Cordless vacuum cleaners have undeniable advantages compared to traditional vacuum cleaners. They have no cords to bind you to the power source and limit your movements. They are compact, easy to store, always ready to work, and need less energy to go. 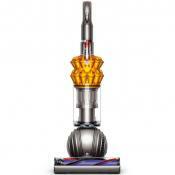 Cordless vacuums are intended for light everyday cleaning, so that your house, apartment, or car always were neat. 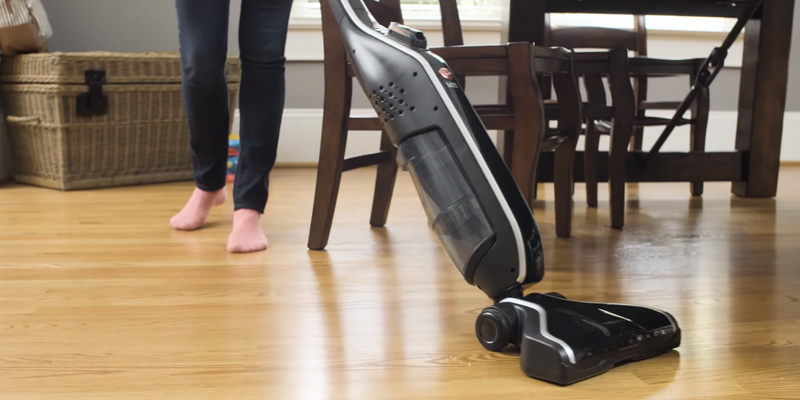 In our cordless vacuum review, we suggest you look at different types of devices, like robotic vacuums, handheld vacuums, car vacuum cleaners. 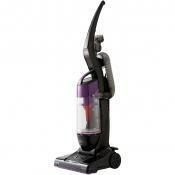 And, depending on what tasks you need to perform, you will be able to choose the best cordless vacuum among them. All models of cordless vacuum cleaners can be divided into three main Types: robotic vacuums, handheld vacuums, and stick vacuums. Robotic vacuums fall into the smart household appliances category. They perform automatical cleaning after you select a sufficient program. You can use them to clean the floors. 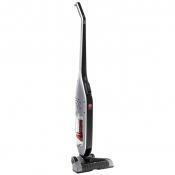 Handheld vacuum cleaners are compact cordless vacuums for cleaning small apartments and furniture. They have rather short operating time. 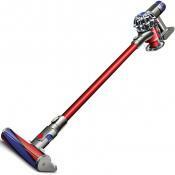 Models of stick cordless vacuums look a lot like traditional vacuums, but thanks to a battery they are lighter. Another important parameter for a cordless vacuum cleaner is its Performance. The first thing to look at when choosing a cordless vacuum is its battery voltage. The higher the voltage is, the stronger the suction of the cordless vacuum is. For the up-to-date models of cordless vacuum cleaners, the voltage varies from 6 V to 20 V, but we recommend you to look at devices with voltage no lower than 12 V. Performance is also affected by the time the cordless vacuum works autonomously. With the longer time of autonomous work you can clean larger areas, right? There are devices that work less than 20 minutes, they are good for cleaning your car's interior. If you plan to use the cordless vacuum cleaner to tidy your room, we suggest you consider those working for 30 minutes or more. And do not forget about the charging time of your cordless vacuum. If it charges for too long, you will not be able to use it many times per day. The next things to think about are the vacuum cleaner's weight and dirt canister capacity, as they strongly affect the Ease of Use for this device. With a lighter model of a cordless vacuum cleaner you will be able to clean for longer periods of time and not feel any fatigue, and also, it will be easier to reach the places that are hard to get to otherwise. The dirt canister capacity means how often you will need to clean the container, so, the bigger it is the less attention it will need. 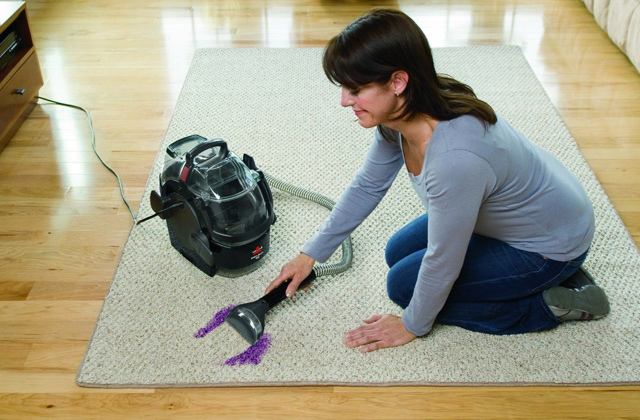 As most of the cordless vacuums are intended to do a partial cleaning, manufacturers tend to settle on the 1 liter or fewer dirt canisters. In order to not use a lot of time to clean the canisters, go for the models with plastic containers. To clean those you will only need to take them out of the cordless vacuum and shake them out into your garbage can. In case you plan to use the cordless vacuum cleaner for different surfaces, carefully consider the Package of your cordless vacuum. The availability of various brushes and nozzles will allow for widening your cordless vacuum's scope of application. For example, a crevice tool will help you to deal with dust in hard-to-reach places, and a pet hair brush will easily clean everything your favorite cat or dog (or another pet) has left on your couch. 2. 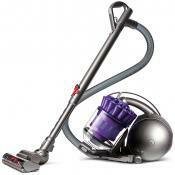 Megan Wollerton Vacuum buying guide, CNET. October 22, 2013. 3. 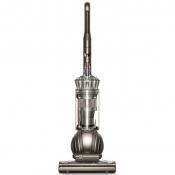 Vacuum Buying Guide, Consumer Reports. March 2016. 4. Vacuum cleaners buying guide, John Lewis. 5. 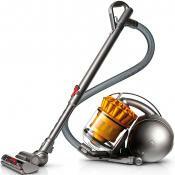 Mattew Knight How to buy the best cordless vacuum cleaner, Which? 6. How to Choose a Cordless Vacuum, wikiHow. 7. Chris Barnes Stick and handheld vacuum cleaner buying guide, Choice. December 9, 2015. 8. 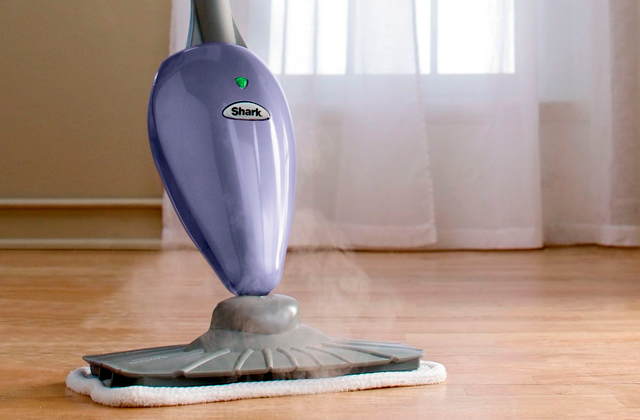 Shana Ecker The Best Vacuum Cleaner For Your Home, The Huffington Post. October 20, 2012. 9. 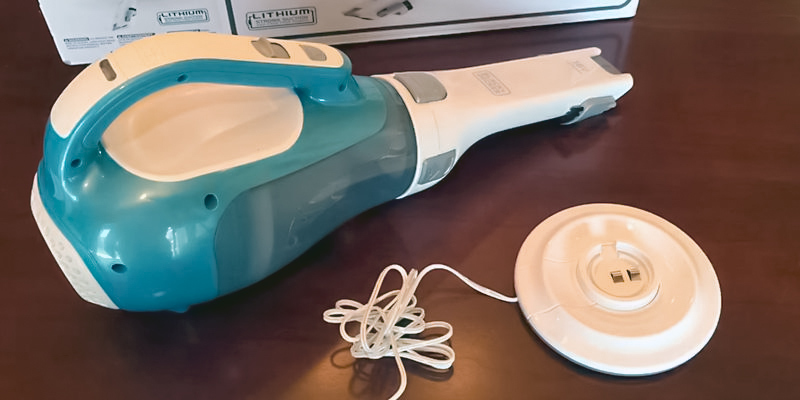 Handheld Vacuum Buying Guide, ConsumerSearch. May 2016.